The Frenchman Hills – Tonnemaker Mammoth Site is owned and operated by Tonnemaker Hill Farm of Royal City, Washington. 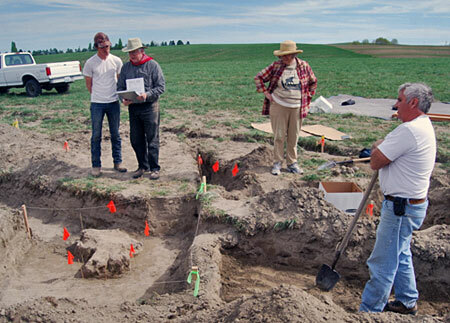 In March 2015, Luke Tonnemaker unearthed some large bone fragments while moldboard plowing up an alfalfa field (to prepare it for replanting) on the north side of Frenchman Hills in Grant County, Washington. 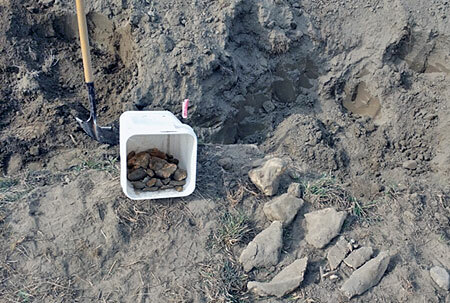 Exploratory excavation recovered a number of bone fragments in the top 75 cm (2.5 ft) of the soil profile. 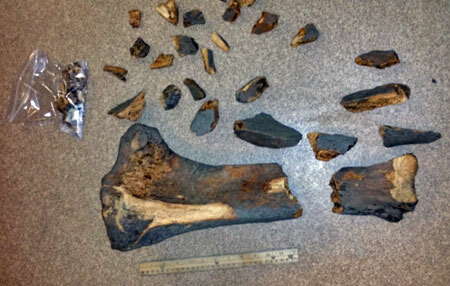 The largest bone fragment was tentatively identified as a mammoth tibia. Additional bones were found about 12 m (40 ft) away. Excavations were expanded on March 28, 2015 to include the new findings. Note the location of the mammoth’s skull in the lower left corner of photo below. Formal excavations were concluded on April 19, 2015 with extraction of the skull (below). The top part of the mammoth skull was recovered. Although it was missing the tusks, it was obvious where they should have been (bottom of photo). Kole and Luke Tonnemaker continued to excavate the site and recover additional bones every opportunity they had as long as it did not interfere with their primary farming operation. Over 150 field specimens have been collected. 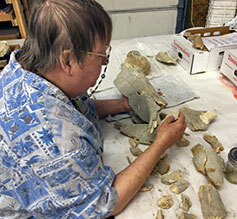 Work continues to clean, preserve, reassemble, document, and interpret the many recovered mammoth bones. Note the fibula on the right. 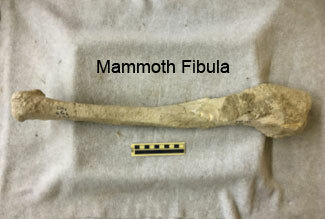 Radiocarbon dating of samples from the tibia were unsuccessful due to the presence of modern alfalfa roots that had penetrated into the specimens. 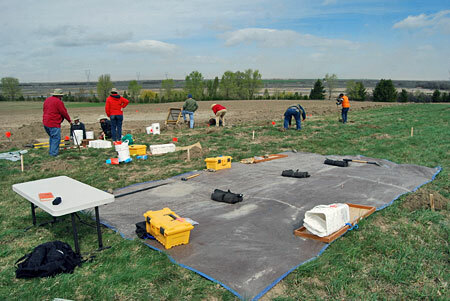 Geologic research has included trench logging, borehole sampling, tephra (volcanic ash) analysis, X-ray fluorescence analyses, and optically stimulated luminescence (OSL) analyses. 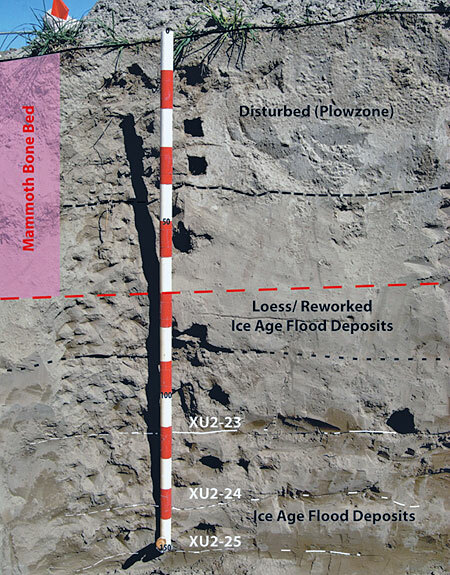 Preliminary analysis of samples from three tephra (volcanic ash) layers (XU2-23 through -25) suggested that the lower most samples were likely to be of Mount St. Helens set “S” ash dated at ~13,600 to 12,500 C14 yrs BP) and that the mammoth bones could be as young as 10,740 C14 years BP (Amara 2016, Dodd et al. 2016). Amara, M. 2016. 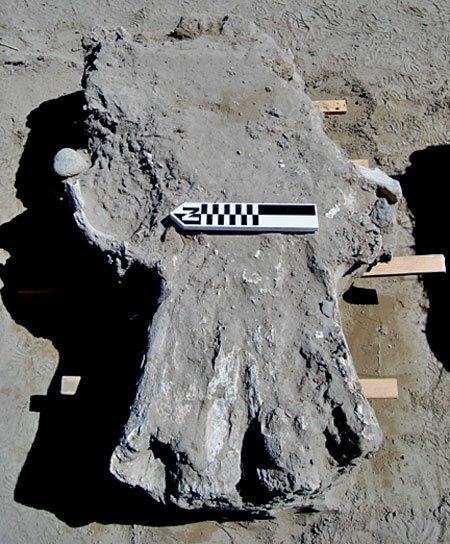 “Ancient Mammoth Unearthed” in Coulee Corridor Byway Beat. Volume 5, Issue 1, March 2016, p. 3-4. Dodd, Jessica L., George V. Last, Mark Amara, Kole Tonnemaker and Luke Tonnemaker. 2016. 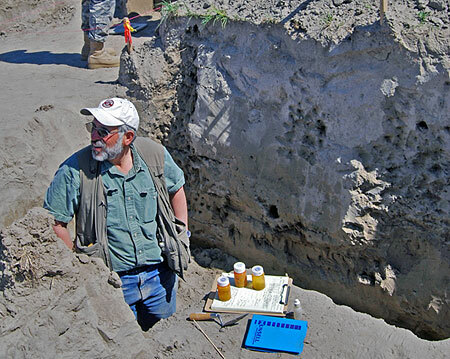 “Tephra Chronology of the Frenchman Hills - Tonnemaker Mammoth Site: Shedding light on its Geologic History.” Northwest Scientific Association Program and Abstracts, March 23-26, Bend, OR, p. 51.